Product #3037 | SKU SATM10 | 0.0 (no ratings yet) Thanks for your rating! 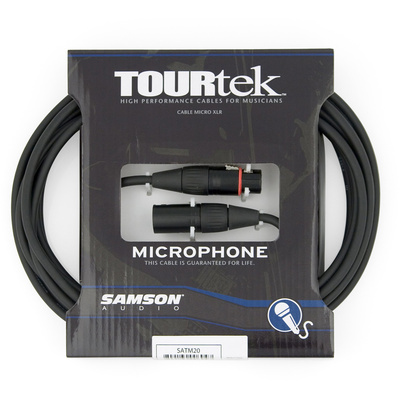 Tourtek Microphone Cables feature two 24-gauge multi-strand inner conductors wrapped in a braided copper shield with 96% coverage protected by a 6mm PVC outer jacket. The result is a premium cable with low capacitance providing excellent rejection of RFI/EMI interference, extremely low noise and superior sound quality. These mic cables are available in a variety of lengths to ensure you have the appropriate cable for any application. Available in 3', 10', 20', 30', 50' and 100'. It is made of two 24 gauge multi-strand inner conductors, wrapped in a braided copper shield with 96% coverage, protected by a 6mm PVC outer jacket. 96% coverage copper-braided shield rejects RFI and EMI for a lower noise floor and increased resolution.